This hose has been upgraded to the highest quality available. It is made up of durable pressure-resistant latex material. This expanding hose is safe for average water pressure and will not burst or leak. The hose is capable of expanding to 3 times of its length with water and it contracts to its original length when the water is released. Once the hose contracts it is small for convenient space saving storage. Solid Brass fitting for durability and to avoid any leakage. It can be connected to any spray nozzle, sprinkler, or another hose. 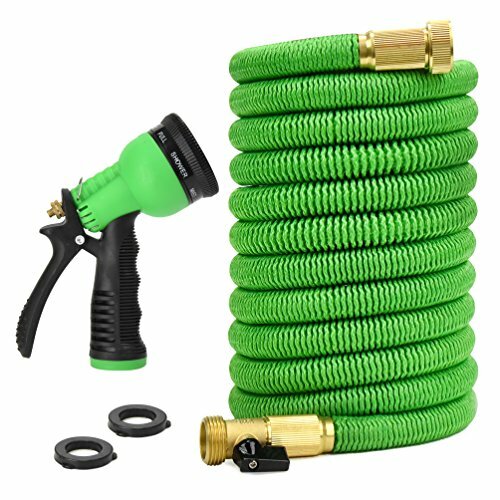 You can order your new flexible and expandable garden hose just by clicking the "add to cart" button now! Flexibility: The hose can expand up to 3 times of its original length. When the water is released it contracts to its original size for easy storage. Lightweight and Portable: Very lightweight weighs about 2.5 lb. The bonus storage bag makes carrying even easier. Durability: Our well-built hose is designed to work with a minimum water pressure of 4 bars (60PSI) and a maximum of 8 bars (115 PSI), with 6 bars (85 PSI) optimum. If you have any questions about this product by Glayko, contact us by completing and submitting the form below. If you are looking for a specif part number, please include it with your message.